After months of rumors and speculation, the LG G7 ThinQ is finally here. As LG’s newest flagship, it has a lot of competition in the premium smartphone market. While the LG G7 ThinQ will undoubtedly be compared to other Android smartphones like the Samsung Galaxy S9 Plus, we decided to mix things up a bit: We’re pitting the LG G7 ThinQ against Apple’s top-of-the-line iPhone X to see which flagship comes out on top. In terms of performance, there is a lot to love about the LG G7 ThinQ. The LG flagship features a Qualcomm Snapdragon 845 processor and an impressive 4GB or 6GB of RAM depending on the model you pick. But how does that stack up against last year’s iPhone X? Not as good as you may think. While the LG G7 ThinQ features a top of the line processor for 2018, it’s no match for Apple’s own proprietary A11 Bionic chipset. In addition to the A11 Bionic outperforming the Snapdragon 845 in most benchmarks, it also offers smoother performance in real-world situations. So with both a 4GB and 6GB RAM option for the LG G7 ThinQ you could assume it would definitely trounce the iPhone X, however that doesn’t seem to be the case. Although the iPhone X only ships with 3GB of RAM, iOS 11 operates more efficiently than its Android competitor, making this comparison a wash. Finally, in terms of battery life and charging, things are neck-and-neck. While the LG G7 ThinQ ships with a 3,000mAh battery compared to the iPhone X’s 2,716mAh battery, it also has a slightly larger display at 6.1 inches versus 5.8 inches. As for charging, both phones offer a fast charging option, as well as wireless charging. Overall, both phones do a respectable job in terms in this category. However, Apple’s A11 Bionic processor gives the iPhone X the win. From the front, you may have a little bit of difficulty seeing the differences between the LG G7 ThinQ and the iPhone X. Both are mostly display with a small top notch (though this can be turned off on the LG G7 ThinQ). The bezels are absolutely tiny on both phones and there’s not a fingerprint sensor or home button to be found. Flip the phones over, however, and the differences become apparent. The LG G7 ThinQ features a centered camera array and fingerprint sensor while the back of the iPhone is much more minimalist, featuring only dual camera lenses nestled on the left side of the phone. While aesthetics are largely subjective, we believe the iPhone X is a more attractive phone overall. It also has a little more heft compared to the LG G7 ThinQ, making it feel like a more premium product. From a durability standpoint, these phones are pretty similar. Both feature a body that is mainly comprised of strengthened glass (Gorilla Glass 5). 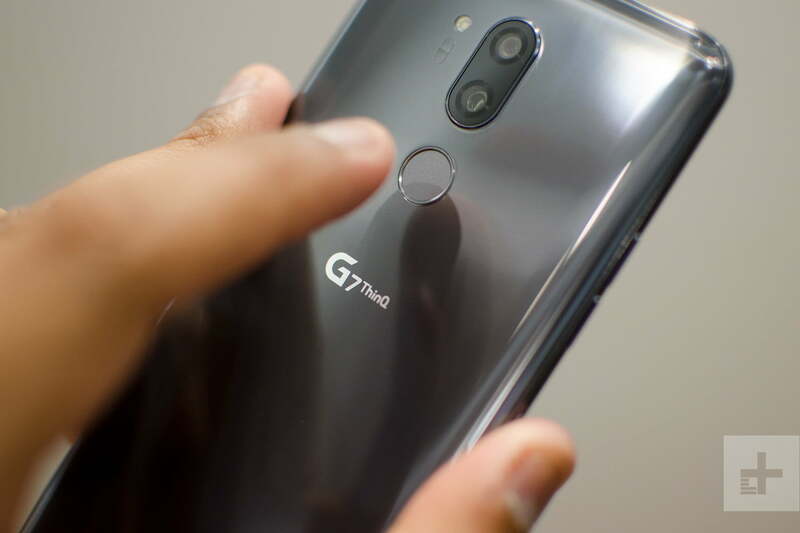 Both are also resistant to dust and water, however, the LG G7 ThinQ features an IP68 rating while the iPhone X comes in at IP67; while the difference is minor, the LG G7 ThinQ is likely to fare better if dropped in deep water. While this category is a close call, we’re giving it to the iPhone X. In terms of design, the iPhone X simply looks more polished than the LG G7 ThinQ and its additional heft makes it a little more balanced providing an overall better feel in hand. Though LG G7 ThinQ may be slightly more durable, the difference wasn’t enough to sway this category in LG’s favor. The LG G7 ThinQ packs a massive 6.1-inch IPS LCD display with a 3,120 x 1,440-pixel resolution. The iPhone X, on the other hand, has a slightly smaller 5.8-inch Super AMOLED display with a resolution of 2,436 x 1,125 pixels. Looking at the specs, you will also see the LG G7 ThinQ has a sharper display than its iPhone foe, coming in at 564 pixels per inch versus 468 pixels per inch. While most of the display specs seem to be in the LG G7 ThinQ’s favor, there’s one major issue: The display technology on the LG G7 ThinQ is inferior to the iPhone X. Even though LG is one of the brightest displays ever made, coming in at 1,000 nits, it just can’t match the AMOLED screen you will find on the iPhone X and other flagships. When comparing AMOLED and LCD displays side by side, the difference is obvious: The AMOLED display consistently provides more vibrant colors and deeper blacks that just can’t be reproduced on an LCD screen. Not surprisingly, the AMOLED display on the iPhone X makes it the clear winner for this category. While LG’s G-series phones have always featured perfectly respectable cameras, the smartphone manufacturer went all out with the LG G7 ThinQ. In addition to updating the hardware on the G7 ThinQ, LG incorporated artificial intelligence into this year’s update in hopes of helping people get the perfect shot in any condition. On the back of the G7 ThinQ, you will find a dual camera array with 16-megapixel lenses. The primary lens features an f/1.6 aperture that should work well in low light. Like the G-series phones, the secondary lens on the LG G7 ThinQ is a wide-angle lens with a 107-degree viewing angle and f/1.9 aperture. Flip the LG G7 ThinQ over and you will find an 8-megapixel wide angle lens with an 80-degree viewing angle and an f/1.9 aperture. In addition to the hardware, the LG G7 ThinQ packs in some new software features. For starters, LG added a suite of A.I. features called AI CAM that was first seen on the LG V30S ThinQ in February. AI CAM identifies individuals and objects and selects one of 19 different shooting modes. There’s also a portrait mode for both cameras on the G7 ThinQ. As for the iPhone X, you will find a dual camera setup on the back with 12-megapixel lenses. Like the LG G7 ThinQ, you will find one wide-angle lens with an f/1.8 aperture, and a secondary telephoto lens with an f/2.4 aperture. You will also find dual image stabilization and optical zoom. We’re giving this round to the iPhone X. Although the iPhone X lacks the A.I. camera features found on the LG G7 ThinQ, it doesn’t seem to need it: Photos on the iPhone X had more vivid colors, better depth, and finer detail than what we saw on the LG G7 ThinQ. Both the LG G7 ThinQ and iPhone X run the latest versions of their respective operating systems, and while Android and iOS offer different overall user experiences, the features on both are largely similar at this point. So basically, we’re judging this category on software upgrades. First off, we would be remiss if we didn’t tell you LG can be a little slow to update its phones. LG just started rolling out the Android Oreo updates for the G6 last month, nearly eight months after it was announced. Since Apple, on the other hand, creates both the hardware and software for its phones it doesn’t need to work with carriers to push updates, meaning it can quickly push updates to everyone using iOS. With that said, LG recently opened a software update center and committed to providing more frequent, and meaningful, updates for its devices in the future. In short, LG claims it wants to provide updates to its phones that will actually make them better over time. For this category, we’re reluctantly calling it a tie. While Apple has an excellent track record of providing frequent updates to its phones, LG’s track record is a little more checkered. However, we do believe LG’s vision of providing updates that will continually improve its devices sounds like an excellent strategy for consumers. In terms of special features, the LG G7 Thin Q comes in strong. It is the first phone we have seen to feature a boombox mode, creating immersive sound with actual bass. It also features a dual camera setup with a 107-degree wide-angle lens. Finally, it’s the first smartphone to feature DTS:X audio via earphones. On the iPhone X, you will find a few awesome special features as well. Perhaps its most popular feature is the TrueDepth camera that powers FaceID. It’s also the tech behind Apple’s Animojis. Overall, LG takes the special features category by a long shot. From its impressive audio technologies to the wide-angle lens we’ve come to love on the G-series phones, the LG G7 ThinQ simply offers a wider variety of special features compared to the iPhone X. When comparing prices between the LG G7 ThinQ, there’s a pretty drastic difference between the two. T-Mobile has announced it will sell the phone for $750, which is significantly cheaper than the $1,000 iPhone X.
Let’s be honest, both the LG G7 ThinQ and iPhone X are excellent smartphones. Both should be able to accomplish the most demanding smartphone tasks with relative ease. But when we put the two phones side by side, the iPhone X comes out as the clear winner. With a speedier processor, better display, and guaranteed software updates for at least several years, the iPhone X is an incredibly hard phone to beat. If you’re planted firmly in Google’s ecosystem, however, the LG G7 ThinQ is an excellent option.